The knock-on effects from the world capitalist crisis are far from over. The weakest countries of the so-called capitalist periphery are suffering the consequences. At present it is the countries of the Maghreb and the Middle East which are in the eye of the storm. Amongst these is Egypt presided over by Mubarak the Satrap (1). Mubarak has held uninterrupted power since 1981. Until the present storm burst out on the streets, he was preparing the juridical-constitutional ground for his son to succeed him; as if the Egyptian presidential republic was a kind of absolute monarchy with a family right to succession. Despite an annual GDP growth of 6%, largely due to oil revenues (not much in absolute terms but enough to satisfy domestic energy requirements) and tourism, (prerogative of the hangers-on at the Presidential court), Egypt has an official unemployment rate of 17%. In fact the figures are an underestimate: at least 30% of the population who are theoretically in work are either unemployed or under-employed. 70% of those without a job include young people, workers, peasants, children of petty bourgeois graduates who, until a few years ago, would have been assured employment with the state. 40% of the population lives under the poverty line, calculated as having a disposable income of no more than two dollars per day. A further 20% is not much above this level, and in danger of falling below it at any time. 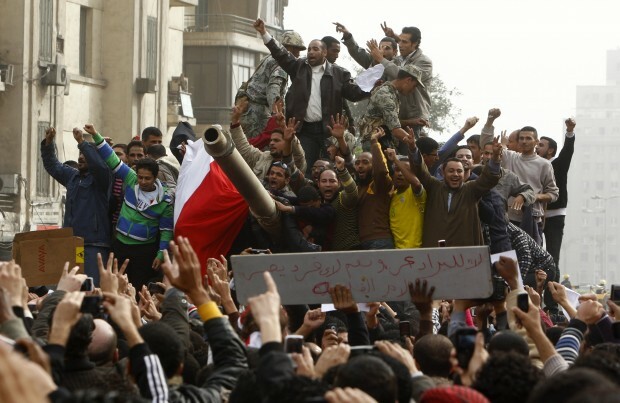 The crisis has put the intrinsic weakness of the Egyptian 'system' into even greater relief. The country's few exports have diminished while imports have increased both in volume and cost, resulting in a significant balance of payments deficit. The State has ceased providing employment opportunities to youth, many factories have closed down or else markedly reduced their activity, while agriculture — kept at subsistence level — has visibly contracted its productive capacity and opened the door to imports of commercial food products. Moreover, international speculation is once again focussing on strategic raw materials: beyond the usual speculation over oil there is now speculation over grains and cereals with repercussions for the conditions of life of the vast majority of the Egyptian population. With the almost total absence of social welfare and a low level of pensions the picture is complete. The streets filled spontaneously. Many are young unemployed, casual, part-time workers and children of workers, disillusioned petty bourgeois becoming proletarian, the despairing of various types, and social sectors without craft or qualifications. In short the usual mixture always present in this type of capitalist reality. The slogans shouted against the dictatorship, against its corruption, have been for bread, work and democracy. At this point the political parties, from the Muslim Brotherhood to the old Stalinists, from the various old democrats to the new Movement for Reform of Mohammed El Baradei, who made a reckless dash from his Vienna residence to be solid with “his” people, were scarcely in sight. Repression was not long in coming. With the Army turning its back on the “Pharaoah” declaring the street protests legitimate, the regime turned to the police. They left at least 150 dead in the streets, decreed a curfew, and blocked all means of communication. Like all threatened regimes, especially where repressive and dictatorial behaviour is normal, it did its job of butchery. The Egyptian crisis, along with that in Jordan and Yemen, is threatening the region’s already precarious imperialist equilibrium. Faced with the tottering Mubarak government the USA and Israel are rushing to take a position. Both Clinton and President Obama have distanced themselves from their old “satrap” who has cost them a great deal. They gave him $1.3 billions a year to reinforce Egypt’s Armed Forces. So far this hasn’t changed. The Americans aim to keep a military and political presence in the southern Mediterranean basin whilst waiting for political change at the top which the revolt on the streets has now made unavoidable. Washington already sees a reassuring substitute in the “squeaky clean” and credible person of El Baradei. He is presented as “new” in a process of change which would leave things as before, both on the domestic front and on the Egypt’s foreign policy alignment. Given the delicacy of the strategic balance this will require some further financial help at the very least. The Netanyahu Government has identical imperialist concerns but takes the opposite line. It is ready to support the old regime from fear that any new one would eventually contain the Islamic fundamentalists of the Muslim Brotherhood. The latter would tear up the Camp David Accord of 1978, which contains the historic article recognising Israel’s right to exist. Such a move would reopen a bloody front which for Israeli imperialism would be no small matter. For the Egyptian working class, as for all workers in revolt from the East to the West of the Mediterranean basin, the objective cannot be confined to simply overthrowing a corrupt dictatorial regime which is starving the overwhelming majority of the population. That is only the first part. The next target of their struggle has to be the capitalist mechanisms which have produced so much social devastation and so much poverty. One “satrap” gone another can take his place, or rather, it opens the way to a democratic solution more suited to re-establishing social peace which would win approval from many Western capitalist states. But once the dictatorship falls many outcomes are possible. Amongst these is the Islamic solution with its heavy burden of social backwardness and visceral anti-communism. Any outcome that remains within the capitalist framework will end up responding to the usual need to preserve the dominance of the imperialist boss, in this case American, without removing the real cause of the crisis – capitalism – and without solving any of the problems which the working class masses are forced to put up with. The great Egyptian and Maghrebian revolt will exhaust itself and be reabsorbed by the system, in spite of all the blood shed, if it does not take the road to class struggle, overcoming all bourgeois obstacles, whatever form they take. In the process they need to become politically independent by building their own class vanguard with its own working class programme. Then, and only then, will the rebellious ferment of the whole area from Casablanca to Cairo, from Amman to Beirut, represent a significant step forward for proletarian internationalism. (1) A satrap was a provincial governor or viceroy in the old Persian Empire. As the reference makes clear later Mubarak is the satrap of the USA.